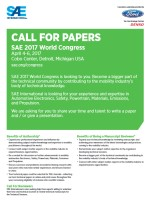 SAE International announces a “Call for papers” for the SAE 2017 World Congress and Exhibition, which will be held April 4-6, 2017, at Cobo Center in Detroit. Contributing to the SAE World Congress is an opportunity for members of the mobility industry to share their expertise to help in the advancement of engineering within the automotive spectrum. SAE International is seeking experts in automotive electronics, safety, powertrain, materials, emissions, sustainability, design and manufacturing and propulsion to share their time and talents to write a technical paper or give a presentation. 4. Selection of the most appropriate technical session. Abstract deadline is Sept. 1, 2016. For more information on the “Call for Papers” and submitting an abstract, visit ae.org/congress/cfp/. Contributing to the SAE World Congress is an opportunity for members of the mobility industry to share their expertise to help in the advancement of engineering within the automotive spectrum. With a continued focus on quality, abstracts and papers will be examined thoroughly by volunteer experts prior to acceptance to a World Congress technical session and then again by the SAE Journal’s Editorial Board for the chance of being selected to one of the SAE Journals. Ford is providing Executive Leadership for the SAE 2017 World Congress and will be joined by DENSO as the Tier One Strategic Partner. Major announcement - coming soon. As the automotive industry continues to evolve, SAE World Congress is changing, too. Stay tuned for exciting details regarding next year's event; this is one event you won't want to miss.